When we compare two (or more) groups of data on almost any kind of graphical presentation — histogram, box plot, x-y grid, time series, rose diagram, whatever — a near-universal question arises: Are the groups significantly different? The familiar answer is given by error bars or confidence intervals in x-y plots or bar charts, assuming an appropriate statistical model, for example a normal distribution, for the data set. 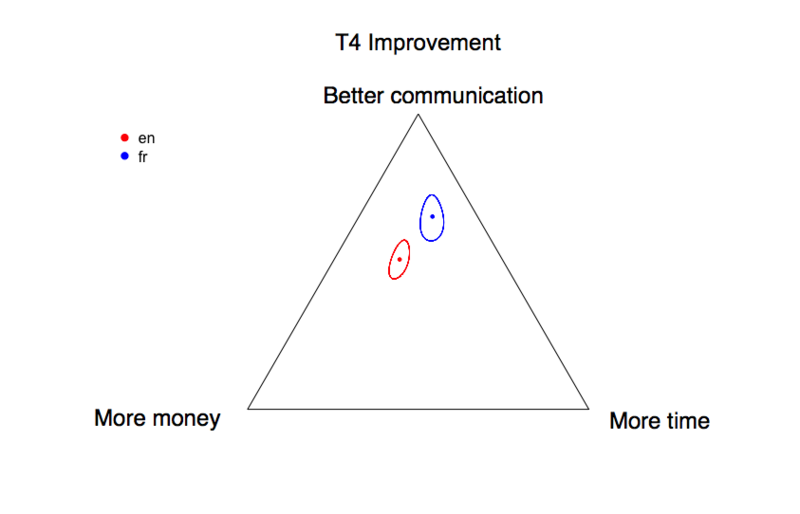 The answer for groups of data in a ternary plot or triad, however, is not as straightforward. The reason for this is rooted in the fly-in-the-ointment issue that I covered at the beginning of Part II of this series, the constant-sum or closure constraint. Whether the coordinate triplets (x, y, z) for each point are extracted from an overall composition and normalized to 100% before plotting, or whether (as in a SenseMaker project) they are constrained to 100% at the moment of data collection, for example, by a finger touching a tablet screen, two restrictions now apply. Firstly, all the data are non-negative and also capped at 1.0 (100%), so any statistical method that assumes non-bounded data (plausibly -∞ to +∞) cannot be used. 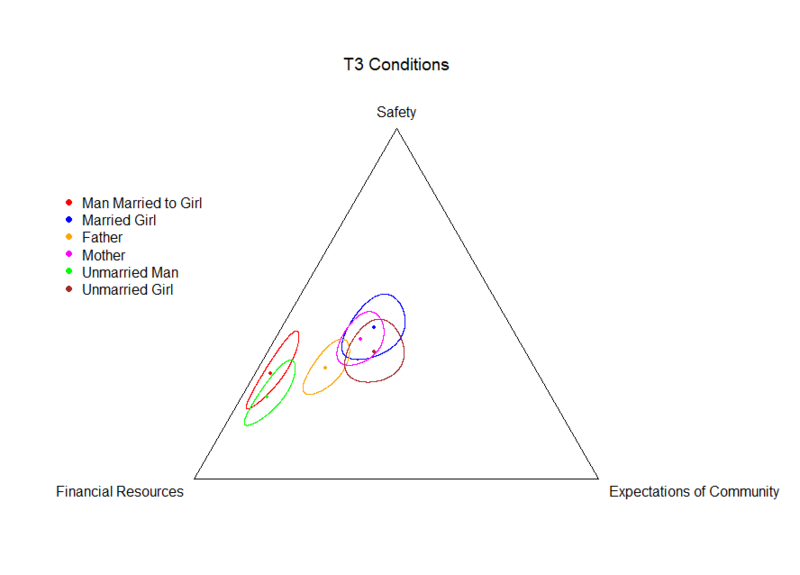 Secondly, only two of the three components are independent, which can lead to spurious negative correlations and other aberrations if the data are not handled carefully. Don’t try this at home… or on your computer! 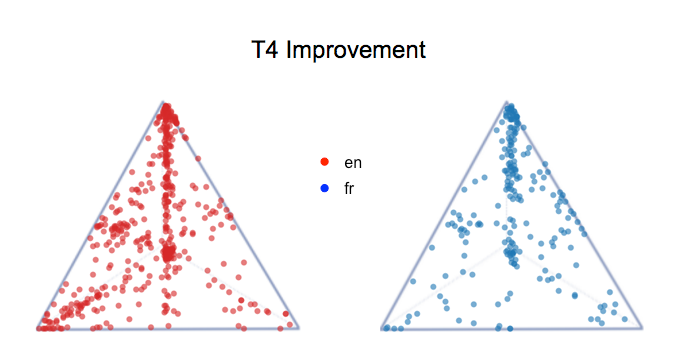 As a geologist, I have mixed feelings about my former profession having pioneered the search for graphical portrayals of confidence limits in ternary plots. The only mitigating circumstance is that the method in most widespread use for several decades was introduced before Chayes (1960) issued the first modern warning about the limitations of working with compositional data. The names of this method — most commonly “hexagonal field of variation” or “error polygon” — are accurate descriptions. truncate each line where it intersects those for the other two components at the same confidence level. Contrast this with Weltje’s right-hand image (B), which shows the same data for river sands, with closed contours for the same three confidence levels. 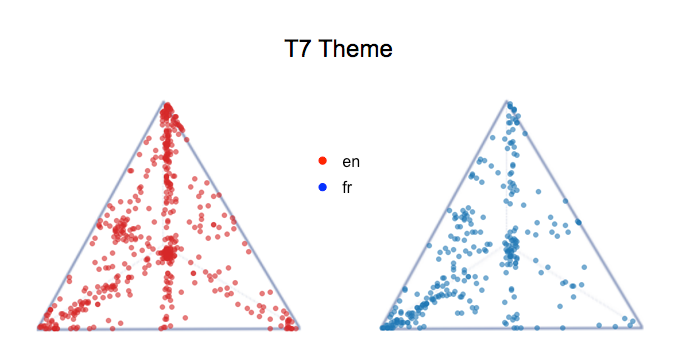 Again the inner set is for the population mean (+), but notice that, compared to the mean in image A, it is now slightly shifted to the left of the two nearest data points. In A, the + was the arithmetic mean; in B, it is the geometric mean. The outer set of contours is again for the overall population of samples. 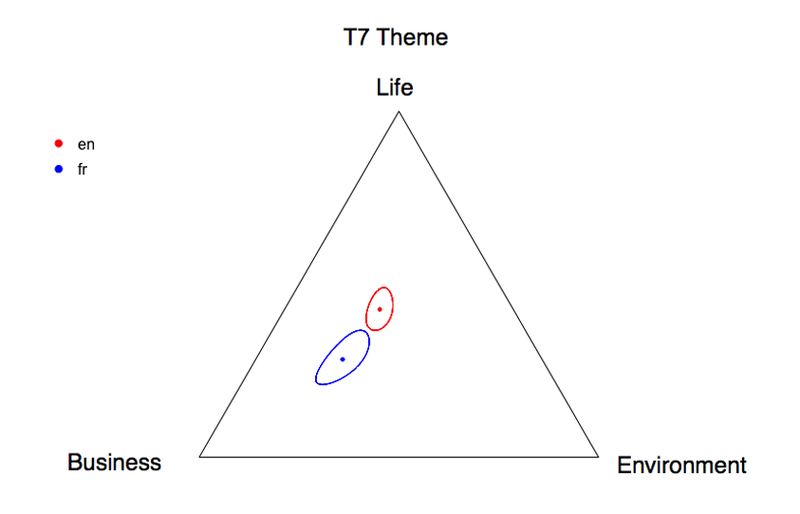 Weltje (2002) developed this methodology for confidence regions in the triad as a direct extension of Aitchison’s (1986) approach to compositional data. His historical discussion and examples are entirely geological, but his attention to the rationale is lucid, and the math is moderately accessible (facility with linear algebra required). In a subsequent post, The Story as Unit of Observation, I discuss parallels between the geological and sensemaking perspectives. For now, however, let’s look at some examples of confidence regions from SenseMaker projects. In the 15 years subsequent to Weltje’s paper, the math has been amplified and extended by Pawlowsky-Glahn and colleagues (see the Additional Readings at the end of Part II). More importantly, within the open-source R community, there are now packages that implement various formulations of Aitchison’s log-ratio transformations for compositional data, including confidence regions and the plotting thereof. So, having revived our command-line skills, and with considerable assistance from Ashton Drew, we jumped into R.
The lead-in was “What would have made the situation even better?” See the labels for the corners below. The lead-in was “The overall theme in this story revolves around…” See the labels for the corners below. Arguably the most interesting results are likely to arise when comparisons involve multiple cohorts, offering the possibility of simultaneously identifying similar (overlapping) and different (non-overlapping) responses to the same prompts and lead-ins. 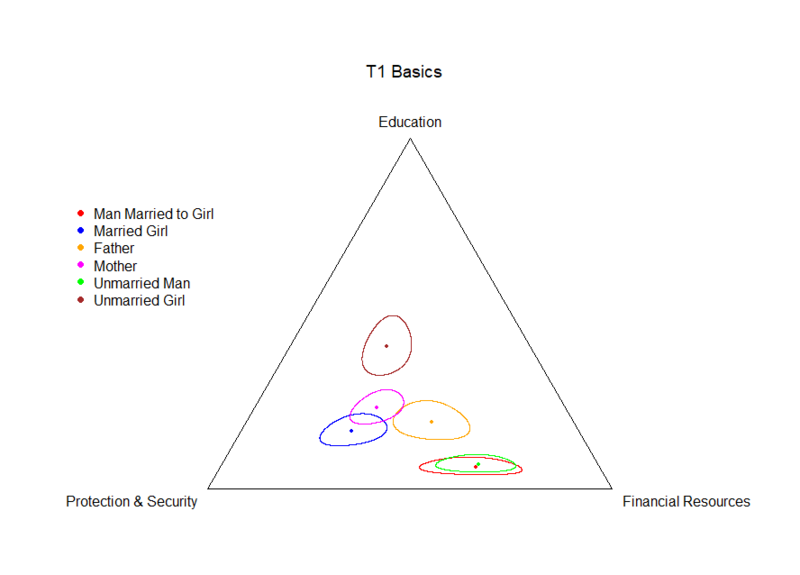 Here are two examples from a project by a not-for-profit organization concerning a refugee population that included (among others) unmarried and married girls (ages 13-24), mothers and fathers of the girls, husbands of the girls, and unmarried men (otherwise similar to the husbands). You don’t have to know anything about the society or culture involved to recognize the disparity in value placed on education by the various groups. And to appreciate the guidance that such clear results might provide for the client and supporting agencies, to say nothing of the benefit that might accrue to the unmarried girls in the long run. Aitchison, J. (1986, reprinted 2003) The Statistical Analysis of Compositional Data. The Blackburn Press, Caldwell NJ. 416 pp. plus additional material. Chayes, F. (1960) On correlation between variables of constant sum. Journal of Geophysical Research, v. 65, p. 4185-4193. Pawlowsky-Glahn, V., and Barceló-Vidal, C. (1999) Confidence regions in ternary diagrams. In “Old Crust – New Problems,” Freiberg ’99. Geologische Vereinigung, v. 89, p. 37-47. Weltje, G.J. 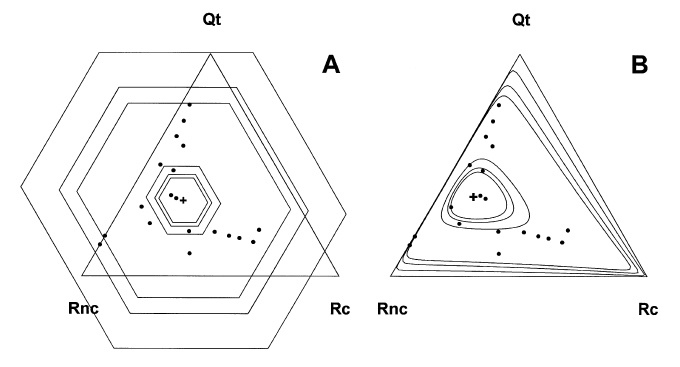 (2002) Quantitative analysis of detrital modes: statistically rigorous confidence regions in ternary diagrams and their use in sedimentary petrology. Earth-Science Reviews, v. 57, p. 211-253.